This expanding shelving unit by Austrian designer Stephanie Hornig can bunch up or stretch out depending on how much space you have. The Set shelving comprises a beech-wood frame with scissor-like pivots plus folded steel shelves. These sit over rails between each joint and stop the structure stretching any further. "Strategic cut-outs form shelves that can be fastened on the axes of the flexible structure in order to fix it in position," said Stephanie Hornig. She explained how the positions of the notches allow the unit to rest in three different positions and small bookends can be slotted against the diagonals in a similar way. Other adaptable bookshelves on Dezeen include interlocking shelves that slide out to make space for more books as required - one of our most popular stories ever - and hinged boxes that can be spun round to create a neat grid or a scattered circle. Inspired by braided structures I aimed to design objects that could create a two- or threedimensional pattern that is stretchable. 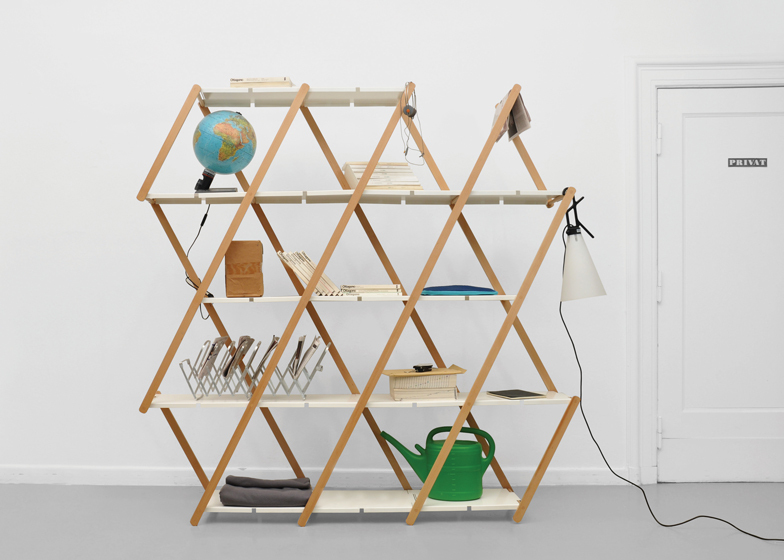 The resulting shelving system is based on the principle of a scissors grid with extended axes to make room for shelves. This creates a superimposed image of diagonals, which is adjustable and can be fixed in three different positions. Bended, powder-coated steel sheets with strategic cut-outs form shelves that can be fastened on the axes of the flexible structure in order to fix it in position. Additionally, simple bookends can be inserted that lean directly against the wooden struts.